Even vegans can enjoy this Shavuot treat. As the Jewish calendar’s most dairy-friendly holiday, Shavuot‘s list of traditional foods reads like a who’s who of milk and cheese. And aside from perhaps the sour cream-topped cheese blintz, no dairy recipe is more iconic on Shavuot in America than cheesecake. In The Book of Jewish Food (Knopf, 1996), Claudia Roden writes that Jews started making cheesecake, or kasekuchen in German, in Central and Eastern Europe where it was popular in both Jewish and non-Jewish cuisines around the 18th-19th centuries. The dessert was a natural fit for Shavuot, which falls during springtime right as people’s cows and other animals were giving birth, and therefore producing milk. Making soft curd cheese was the perfect way to extend the shelf life of excess milk–a practice that Roden writes was popular amongst Eastern European housewives. It was not until Jews migrated to America, bringing their recipes and affinity for cheesecake with them, that the dish took on a specifically Jewish identity. And it was not until the 20th century that New York-style cheesecake emerged. 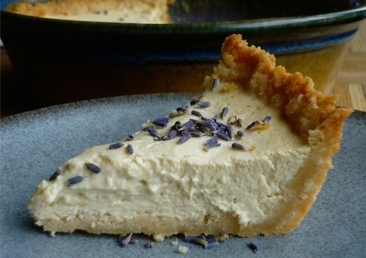 Unlike its European ancestors, New York cheesecake was dense and smooth, rather than textured. As Arthur Schwartz writes in Jewish Home Cooking (Ten Speed Press, 2008), in 1872 a “New York dairy man…combined cream with milk to create an ultra rich cheese.” By the 1880s, the product was being produced and distributed under the name Philadelphia Brand cream cheese, and was primed to take homemade curd cheese’s place in American Jewish kitchens. Schwartz writes that the new cream cheese-based cheesecake was popularized in famous New York delis (non-kosher, of course) such as Reuben’s, Lindy’s and later in Brooklyn at Junior’s. In America, the basic cheesecake recipe was also altered by the addition of fruit toppings (e.g. cherries, strawberries, and blackberries in syrup) and whipped cream. Like the bagel, cheesecake in America has transcended its Jewish identity. Junior’s cakes are now sold through the national shopping network QVC, and The Cheesecake Factory has nearly 150 locations across the country. Still the sweet, creamy treat remains a Jewish classic, and a no-brainer for the Shavuot table. Check out Joan Nathan’s recipe. If you want, change things up by topping plain cheesecake with fresh fruit, chocolate chips, jam, chopped crystallized ginger, or fruit syrup. You can experiment with the crust by swapping ginger snaps, chocolate or vanilla wafers, or oatmeal cookies for the graham crackers. Combine graham cracker crumbs, lemon zest, and margarine and stir to evenly coat the crumbs. Press the mixture into the bottom of a 9-inch pie pan and refrigerate while making the filling. Preheat oven to 350 degrees. Place silken tofu and vegan cream cheese in the food processor or blender and process until smooth. Add sugar and process until well combined, approximately 3 minutes. In a separate bowl, combine lemon juice, vanilla, and ginger. Whisk in cornstarch, then pour mixture into food processor and blend until smooth. Pour into crust and bake for 45 minutes until set (the center will still be slightly wobbly). Allow to cool to room temperature, then refrigerate for at least 4 hours or ideally over night. Pulverize almonds in a food processor until they become powdery and flour-like. Transfer almond flour to a bowl and stir in crushed shortbread cookies and sugar. Add melted butter and stir to coat evenly. Tip mixture into a 9-inch pie pan and press evenly into the bottom and sides. Refrigerate while making the filling. Preheat oven to 350 degrees. Gently crush the lavender buds and put in a small bowl. Pour 2 1/2 Tablespoons of boiling water over them and let steep for 15 minutes. Strain out lavender buds and set aside approximately 1 Tablespoon of the lavender-infused water. In a medium bowl, beat together the cream cheese, honey, and vanilla until smooth. Beat the eggs in one at a time until well blended. Pour in the lavender infusion a little at a time, stirring until fully combined. Pour into pie crust and bake for 35-40 minutes until the filling is just set, but still a little wobbly in the center. Let cool to room temperature, then chill for at least 4 hours or ideally over night.